Great texture and color. I was not sure the duvet would be sturdy, but I was pleasantly surprised by the qualify. The color is vibrant and pops against neutral colors. Great product. 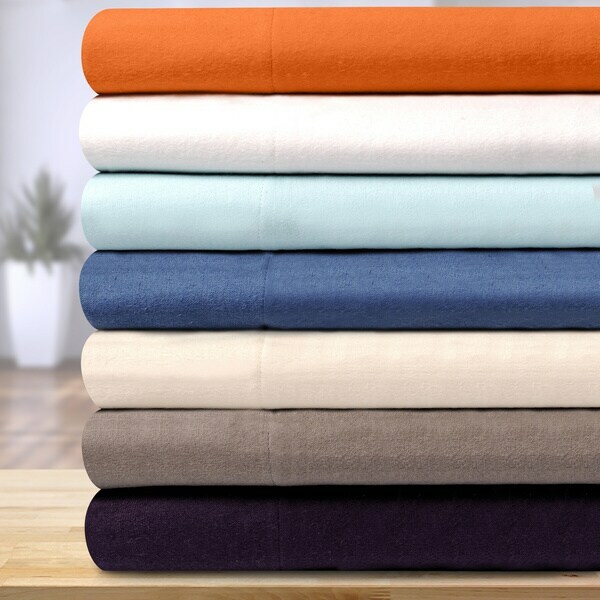 This 100-percent cotton flannel duvet cover set will add classic style to your bedroom with comfort. The reversible duvet cover gives you the option to change the look of your room whenever you want. Select from an array of color options to update your bedroom and add more contemporary flair. I have had a hard time finding quality flannel products and it is even harder to find a flannel comforter anymore especially in my color scheme. This set is excellent. First of all I was thrilled that I could use my existing comforter and simply put this flannel cover over it and just like magic it goes from summer to winter use. It is thick and warm. It is extremely easy to put on the comforter and pillows plus that added bonus I was able to order it in a vibrant shade of purple which is part of my color scheme. Disappointed in the quality of the flannel in this duvet cover. I washed it out of the package and it immediately pilled and looked worn. Cheap fabric! Pleased with the quality and softness. this duvet cover and sham are very nice - good color and fabric. But it is a 2-piece set....not three. My favorite duvet cover ever. I love this duvet cover set and the price was great. I bought the purple, which is a nice dark shade. The material is a nice solid flannel, it comes out of the package so soft, and it fits my comforter perfectly. Good price, but very scratchy even after washing. I expect flannel to be soft and cuddly. I will use them this season, though. Cannot recommend. The package arrived and my disappointment was great. The Flannel is of poor quality, after washing the Duvet it was pilling tremendously and the lint catcher in my dryer was filled. This material is inferior to the German Flannel Duvet I purchased some time ago. I should have purchased the German-made Duvet I had planned on buying, but was lured by the cheaper price. I've learned my lesson! I purchased this flannel duvet because I like the soft feeling of a flannel duvet. I used it all winter. It washes and dries well, keeping its shape. The price was a plus with this item. Its OK. Not great quality. This is a great duvet. Very thick I am still using my summer down blanket because the cover is soooo warm! Soft and cozy, the color didn't fade after washing it a few times. Being flannel, it is a nice layer of warmth on those cold windy nights. It makes getting out of bed in the morning a little tough though! it's nice, soft, etc. but it did get a little pilly after one wash.
"Does this go inside the duvet cover. Mine hasn’t arrived yet"
This product is a cover to any down and/or down alternative comforters. "where is this manufactured and how dark is the blue? Is it more like chambray as pictured?" Hello nagl, the country of origin is India. The blue is more of a denim color in my opinion. Please let us know if you have additional questions. Thanks for shopping with us. It is flannel, and I needed a duvet in blue color. It is the right color and right size. "If I purchase the white is the contrasting color blue?" "I am looking for a queen size in blue; will you have any available in the very near future?" Hello love2shop, items are restocked as they become available; however we cannot guarantee an item will be restocked. Thank you for shopping with us. "Does this cover have internal ties to secure the devet? Thanks." Hello yuki5469, I hope your day is going well. This cover has buttons to secure the duvet. Thank you for shopping with us. "How soft is this? My son is very tactile. Thanks"
Hello marci4664, this duvet is very soft, however we have no way of knowing how the softness compares to your son's standards. Have a good day!